Life can be an emotional roller-coaster for most small town physicians. One minute they can be experiencing the ‘high’ of bringing new life into the world, and the next, faced with informing a family that one of their loved ones have died. Not one to make light of the dramatic experiences that often make up the life of a doctor, Nancy understands the toll that her job can have on one’s emotions. But for her and her husband Dr. Mark Adams, a fellow family-based doctor, the emotional rollercoaster and the 24/7 work schedule cannot compete with the satisfaction that comes with saving lives and caring for the Scugog community. Nancy and Mark decisively agreed from the beginning that Port Perry was the ideal place for them to begin their careers and raise a family of their own. While Nancy was originally drawn to Port Perry in her years of “residency” – a term used to describe the time period when medical students are trained within a clinic and hospital – getting the opportunity to practice in the town would prove to be a challenging feat. Although Nancy grew up in London, she became familiar with the area after meeting Mark, who had grown up in Blackwater. It was a combination of the small-community feeling and the nostalgic charm of the town that prompted Nancy to request her residency in Port Perry. “Port Perry is actually a very popular training site,” she explains, adding a lot of students want to be placed here. Because the process of choosing residents is done through lottery, Nancy continued to wait for her preferred choice and her chance would eventually come after her two years of training was actually over. She came to the town during her “elective time” but once she arrived, she knew she had found the perfect place. Mark also had his heart set on Port Perry. “We always wanted to practice rural medicine,” he explains. By practicing rural, Mark and Nancy have the opportunity to work in multiple disciplines of medicine. While both are primarily family-based doctors, Mark also specializes in anaesthesiology and emergency and Nancy, after giving up “emergency duties” found her forte in obstetrics. She is also the current leading physician for the Maternal Child Program at the hospital. Nancy explains that her choice to focus on obstetrics stems largely from the special relationship she was able to develop with her patients. “As both a family doctor and obstetrician I get to deal with every spectrum of the human dimension. The best part is being there to deliver (babies) for my own patients,” she says. As a result, Nancy says she is able to establish an extraordinary connection with her patients and this is due to both the small-town nature of Port Perry and her involvement in multiple disciplines. Nancy says, originally she was intrigued by internal medicine, which is the study of internal complications of the body, and she followed this passion to university. While this factor is still true, she now finds more solace in her patient relationships. Nancy says it is not uncommon for her patients to stop by with lunch or dinner when they know she and Mark are struggling to juggle their hectic lifestyle. “It’s this support that makes us want to stay,” Mark adds. Mark describes his path towards medicine as more of a “transitional” phase than a childhood aspiration. “You find your way to it, it’s part of a path and the inspiration comes along the way,” he explains. As a student who loved problem solving and working with technology, it was simply the perfect fit for him. “It’s about compatibility – realizing what you do your best in,” he explains with confidence and ease. 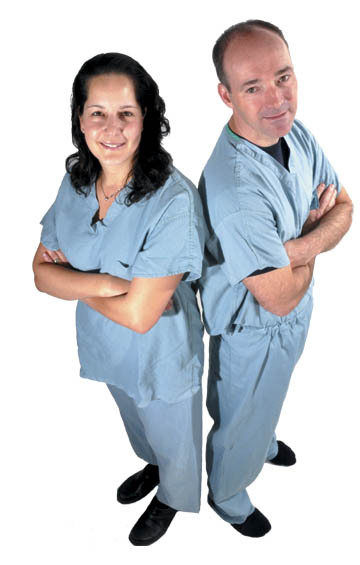 After meeting in medical school at the University of Toronto, Mark and Nancy would see each other through years of intensive medical training. As if this were not enough to challenge a relationship, the couple decided to take a road trip across Canada together after only a year of dating. Both Nancy and Mark joke that after enduring seven weeks of travelling 13,000 kilometres together, they knew they could handle marriage. It would be a total of eight years of schooling - two years of undergraduate study, four years of medical school and two years of family practice - before the happy couple would settle down to practice in Port Perry and join the Medical Associates of Port Perry. Now, ten years later, the couple are happy to call Port Perry home and are relishing the joy that comes with starting a family of their own. Nancy just recently gave birth to a beautiful baby girl and the couple also have a son in his toddler years, which keeps them very occupied on the domestic front as well. Of course, with two young children at home it is hard not to imagine the disadvantages or complications that result from working such a time-constraining and strenuous job. First of all, there is the predicament of the 24 hour work schedule that both Nancy and Mark must adhere to. “We have to be ready to go at any time of the day if need be,” says Nancy, before adding that there is a fine line between home life and work life. Secondly, there is the anxiety that forms as a side effect of staying in tune with all the latest news and findings within the health world. And now with young children of their own, sometimes this new information can be distressing. Nancy recalls a time when her young son was sick and his symptoms led her to think that he had a serious ailment. She later realized his condition was not anything near what her mind first led her to believe. “There is such a thing as knowing too much,” she admits. “Sometimes you automatically think the worst.” It can be stressful and emotionally-draining, especially when both parents are susceptible to the same “unpredictable” work schedule and the same alarming research. But, with Nancy and Mark, it is impossible to notice any sign of grievance or resentment. They are accustomed to the lifestyle and, while there may be some “obstacles” they admit to with their line of work, both doctors are appreciative and eternally grateful for the work environment they are a part of. This environment includes their involvement with the Medical Associates of Port Perry – a group which formed in the early 70s and currently consists of 25 doctors who practice in a clinic across from the hospital, Port Perry Lakeridge Health. Mark adds that the advantage of working with the same staff is the unsurpassed teamwork that results from spending years together. Spending years together means plenty of comical situations that help to bring a little relief to what can often be a hectic and traumatic work schedule. Nancy remembers one particular case when an emergency patient, who also happened to be a reporter, used his unfortunate incident as material and research for a news story. “He continued to ask questions about what I was doing so that he could write about it later,” she says with a laugh – proof that a journalist will make use of any situation for a story! Mark recalls caring for a patient in emergency who continued to ask every five minutes what had happened. Fortunately, the patient was fine, but he suffered from short-term memory loss. After answering the same question repeatedly every five minutes, Mark jokes that he and the other physicians decided they should have posted a note for him to re-read each time he forgot. Aside from their work within the clinic, both doctors have a special devotion to teaching. As members of the Medical Associates team, they teach new medical residents from the University of Toronto and Queens University. The interesting part of the job, they insist, is that the same residents Mark and Nancy act as a safety-net for are the ones who keep the local doctors in tune with the ever-changing climate of the medical world. “We all rely on each other,” says Nancy. After all, as she explains, the doctors of Medical Associates all take care of one another – literally. Each and every co-worker is another co-worker’s doctor or patient, both explain. It is easy to see that Mark and Nancy both view their relationships with their patients as one of their top priorities. It’s almost as if their co-workers and patients are a part of their external family. Both credit the special nature of Port Perry and the surrounding area for their ability to practice this way. “It makes the job so much more meaningful,” Nancy says with a heartfelt smile.